James A. 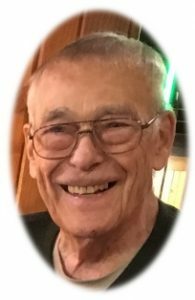 “Jim” Horstman, age 88, of Port Washington, WI died peacefully Thursday, May 18, 2017 at Lawlis Family Hospice in Mequon, WI, with his family by his side. He died from complications of a stroke. Jim was born on June 14, 1928 in Chicago, IL; son of Edward C. and Lily May Mosely Horstman. After high school, Jim enlisted in the United States Marine Corps and served active duty and reserve duty from 1946 through 1949. In 1950, Jim returned to active duty in Korea, seeing heavy combat with Able Company, First Marines. He was wounded twice in action in 1951 and was awarded two Purple Hearts. On November 24, 1951, Jim married Jeannine C. Veesenmeyer, also of Chicago, at the United Methodist Church in Chicago. He worked as a News Bureau police reporter and also as a news editor for ABC and CBS radio affiliates in Chicago. Jim founded Motivation Dynamics, Inc. and The Delos Company, two highly successful Chicago-area public relations/marketing firms, which he operated for forty years. He retired in his mid-70s. After living in various Chicago suburbs, he and Jeannine moved to Port Washington, WI in 2002, living happily on James Drive. He often told people that Port Washington was the best place he had ever lived. He loved the harbor, the town and the people of Port Washington. While residing in Port, Jim was an active member of the Ozaukee YMCA and the Port Washington Historical Society. He held a private airplane pilot license; he was a scuba diving instructor; and he also piloted gliders. He and Jeannine traveled extensively in Europe, the Middle East and Africa. Jim was an avid reader of literature and military history. He also was an avid outdoorsman and collector of military memorabilia. Later in life, he enjoyed painting. After fifteen years of living in Port, he eventually shifted his baseball allegiance from the White Sox to the Brewers, but remained a devoted Bears football fan to the end. Jim is survived by his wife of 65 years, Jeannine; his son Jim (Peggy) Horstman of Dixon, IL; and his daughter Cathleen (David) Buthman of Eagle River, AK. He was preceded in death by his son Michael. He is also survived by his five grandchildren (Whitney, Michael, Mathew, Brandon and Gene) and by his four great-grandchildren (Mason, Maddox, Bella and Albie). As per his wishes, private family services will be held. Memorials to the Feith Family Ozaukee YMCA, 465 Northwoods Road, Port Washington, WI 53074 and the Port Washington Historical Society, 205 N. Franklin St. Port Washington, WI 53074 will be appreciated.